The book itself holds a world record, as the best-selling copyrighted book of all time. As of the 2019 edition, it is now in its 64th year of publication, published in 100 countries and 23 languages. The international franchise has extended beyond print to include television series and museums. The popularity of the franchise has resulted in Guinness World Records becoming the primary international authority on the cataloguing and verification of a huge number of world records; the organisation employs official record adjudicators authorised to verify the authenticity of the setting and breaking of records. On 10 November 1951, Sir Hugh Beaver, then the managing director of the Guinness Breweries, went on a shooting party in the North Slob, by the River Slaney in County Wexford, Ireland. After missing a shot at a golden plover, he became involved in an argument over which was the fastest game bird in Europe, the golden plover or the red grouse (it is the plover). That evening at Castlebridge House, he realized that it was impossible to confirm in reference books whether or not the golden plover was Europe's fastest game bird. Beaver knew that there must be numerous other questions debated nightly in pubs throughout Ireland and abroad, but there was no book in the world with which to settle arguments about records. He realised then that a book supplying the answers to this sort of question might prove successful. Beaver's idea became reality when Guinness employee Christopher Chataway recommended University friends Norris and Ross McWhirter, who had been running a fact-finding agency in London. The twin brothers were commissioned to compile what became The Guinness Book of Records in August 1954. A thousand copies were printed and given away. After the founding of The Guinness Book of Records at 107 Fleet Street, London, the first 198-page edition was bound on 27 August 1955 and went to the top of the British best seller lists by Christmas. The following year, it launched in the US, and sold 70,000 copies. Since then, Guinness World Records has gone on to become a record breaker in its own right; with sales of more than 100 million copies in 100 different countries and 37 languages, Guinness World Records is the world's best selling copyrighted book ever. Because the book became a surprise hit, many further editions were printed, eventually settling into a pattern of one revision a year, published in September/October, in time for Christmas. The McWhirters continued to compile it for many years. Both brothers had an encyclopedic memory; on the TV series Record Breakers, based upon the book, they would take questions posed by children in the audience on various world records and were able to give the correct answer. Ross McWhirter was assassinated by the Provisional Irish Republican Army in 1975. Following Ross' assassination, the feature in the show where questions about records posed by children were answered was called Norris on the Spot. Guinness Superlatives (later Guinness World Records) Limited was formed in 1954 to publish the first book. Sterling Publishing owned the rights to the Guinness book in the US for decades. The group was owned by Guinness PLC and subsequently Diageo until 2001, when it was purchased by Gullane Entertainment. Gullane was itself purchased by HIT Entertainment in 2002. In 2006, Apax Partners purchased HiT and subsequently sold Guinness World Records in early 2008 to the Jim Pattison Group, the parent company of Ripley Entertainment, which is licensed to operate Guinness World Records' Attractions. With offices in New York City and Tokyo, Guinness World Records' global headquarters remain in London, while its museum attractions are based at Ripley headquarters in Orlando, Florida, US. 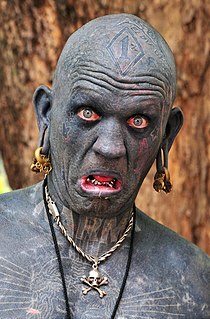 Lucky Diamond Rich is "the world's most tattooed person", and has tattoos covering his entire body. 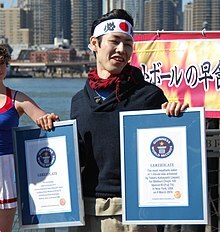 He holds the Guinness World Records title as of 2006[update]. Recent editions have focused on record feats by person competitors. Competitions range from obvious ones such as Olympic weightlifting to the longest egg tossing distances, or for longest time spent playing Grand Theft Auto IV or the number of hot dogs that can be consumed in three minutes. Besides records about competitions, it contains such facts such as the heaviest tumour, the most poisonous fungus, the longest-running soap opera and the most valuable life-insurance policy, among others. Many records also relate to the youngest people to have achieved something, such as the youngest person to visit all nations of the world (Maurizio Giuliano). Each edition contains a selection of the records from the Guinness World Records database, as well as select new records, with the criteria for inclusion changing from year to year. The retirement of Norris McWhirter from his consulting role in 1995 and the subsequent decision by Diageo Plc to sell The Guinness Book of Records brand have shifted the focus of the books from text-oriented to illustrated reference. A selection of records are curated for the book from the full archive but all existing Guinness World Records titles can be accessed by creating a login on the company's website. Applications made by individuals for existing record categories are free of charge. There is an administration fee of $5 to propose a new record title. A number of spin-off books and television series have also been produced. Guinness World Records bestowed the record of "Person with the most records" on Ashrita Furman of Queens, NY in April 2009. At that time, he held 100 records. In 2005, Guinness designated 9 November as International Guinness World Records Day to encourage breaking of world records. In 2006, an estimated 100,000 people participated in over 10 countries. Guinness reported 2,244 new records in 12 months, which was a 173% increase over the previous year. In February 2008, NBC aired The Top 100 Guinness World Records of All Time and Guinness World Records made the complete list available on their website. Cracking open a wheel of Parmigiano-Reggiano cheese as a part of a 2013 world record by Whole Foods Market. For many records, Guinness World Records is the effective authority on the exact requirements for them and with whom records reside, the company providing adjudicators to events to determine the veracity of record attempts. The list of records which the Guinness World Records covers is not fixed; records may be added and also removed for various reasons. The public are invited to submit applications for records, which can be either the bettering of existing records or substantial achievements which could constitute a new record. The company also provides corporate services for companies to "harness the power of record-breaking to deliver tangible success for their businesses." Guinness World Records states several types of records it will not accept for ethical reasons, such as those related to the killing or harming of animals. Several world records that were once included in the book have been removed for ethical reasons, including concerns for the well being of potential record breakers. For example, following publication of the "heaviest fish" record, many fish owners overfed their pets beyond the bounds of what was healthy, and therefore such entries were removed. The Guinness Book also dropped records within their "eating and drinking records" section of Human Achievements in 1991 over concerns that potential competitors could harm themselves and expose the publisher to potential litigation. These changes included the removal of all spirit, wine, and beer drinking records, along with other unusual records for consuming such unlikely things as bicycles and trees. Other records, such as sword swallowing and rally driving (on public roads), were closed from further entry as the current holders had performed beyond what are considered safe human tolerance levels. There have been instances of closed records being reopened. 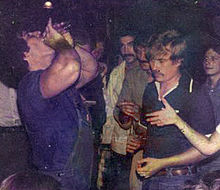 For example, the sword swallowing record was listed as closed in the 1990 Guinness Book of World Records, but the Guinness World Records Primetime TV show, which started in 1998, accepted three sword swallowing challenges (and so did the 2007 edition of the Guinness World Records onwards). Similarly, the speed beer drinking records which were dropped from the book in 1991, reappeared 17 years later in the 2008 edition, but were moved from the "Human Achievements" section of the older book to the "Modern Society" section of the newer edition. As of 2011[update], it is required in the guidelines of all "large food" type records that the item be fully edible, and distributed to the public for consumption, to prevent food wastage. Chain letters are also not allowed: "Guinness World Records does not accept any records relating to chain letters, sent by post or e-mail." For some potential categories, Guinness World Records has declined to list some records that are too difficult or impossible to determine. For example, its website states: "We do not accept any claims for beauty as it is not objectively measurable." On 10 December 2010, Guinness World Records stopped its new "dreadlock" category after investigation of its first and only female title holder, Asha Mandela, determining it was impossible to judge this record accurately. Guinness World Records website publishes selected records and is not supposed to be used for the record verification purposes, as it explains: "There are more than 40,000 current records in our database and we try our best to feature as many as possible online. We currently include over 15,000 records online which we update every week, so make sure to check the site regularly!" The book printed annually contains only 4,000 records. The only way to verify a record is to contact Guinness, and the average response time is twelve weeks. In 1976, a Guinness Book of World Records museum opened in the Empire State Building. Speed shooter Bob Munden then went on tour promoting The Guinness Book of World Records by performing his record fast draws with a standard weight single-action revolver from a western movie type holster. His fastest time for a draw was 0.02 seconds. Among exhibits were life-size statues of the world's tallest man (Robert Wadlow) and world's largest earth worm, an X-ray photo of a sword swallower, repeated lightning strike victim Roy Sullivan's hat complete with lightning holes and a pair of gem-studded golf shoes on sale for $6500. The museum closed in 1995. In more recent years, the Guinness company has permitted the franchising of small museums with displays based on the book, all currently (as of 2010[update]) located in towns popular with tourists: Tokyo, Copenhagen, San Antonio. There were once Guinness World Records museums and exhibitions at the London Trocadero, Bangalore, San Francisco, Myrtle Beach, Orlando, Atlantic City, New Jersey, and Las Vegas, Nevada. The Orlando museum, which closed in 2002, was branded The Guinness Records Experience; the Hollywood, Niagara Falls, Copenhagen, and Gatlinburg, Tennessee museums also previously featured this branding. With the popularity of reality television, Guinness World Records began to market itself as the originator of the television genre, with slogans such as we wrote the book on Reality TV. Suresh Joachim Arulanantham is a Tamil Canadian film actor and producer and multiple-Guinness World Record holder who has broken over 50 world records set in several countries in attempts to benefit the underprivileged children around the world. Some world record attempts are more unusual than others: he is pictured here minutes away from breaking the ironing world record at 55 hours and 5 minutes, at Shoppers World, Brampton. Not to be confused with Guinness World Records: The Videogame. In 2008, Guinness World Records released its gamer's edition, a branch that keeps records for popular video game high scores, code, and feats in association with Twin Galaxies. The Gamer's Edition contains 258 pages, over 1236 video game related world records and four interviews including one with Twin Galaxies founder Walter Day. The most recent edition is the Guinness World Records Gamer's Edition, 2019, which was released September 6, 2018. The Guinness Book of British Hit Singles & Albums was published from 2003 to 2006, based on two earlier, separate HiT publications, British Hit Singles and British Hit Albums, which began in 1977. It was effectively replaced (in singles part) by the Virgin Book of British Hit Singles from 2007 onward. A video game, Guinness World Records: The Video Game, was developed by TT Fusion and released for Nintendo DS, Wii and iOS in November 2008. In 2012, Warner Bros. announced the development of a live-action film version of Guinness World Records with Daniel Chun as scriptwriter. The film version will apparently use the heroic achievements of record holders as the basis for a narrative that should have global appeal. ^ "Corporate". Guinness World Records. Archived from the original on 19 March 2010. Retrieved 19 October 2010. ^ "55 Design - 55 Design Website". Retrieved 12 January 2019. ^ Deacon, Paul (8 September 2017). "As you walk in @WHSmith Straight in front @GWR 2018 collection. Looking mighty fine indeed. 8 months project. #wellworthit #proudpic.twitter.com/sm4wZENRl8". Retrieved 12 January 2019. ^ a b c "Frequently Asked Questions". Guinness World Records. Archived from the original on 24 January 2012. Retrieved 10 February 2012. ^ "The History of the Book". Guinness Record Book Collecting. Retrieved 10 February 2012. ^ Fionn Davenport (2010). Ireland. Lonely Planet. p. 193. ISBN 9781742203508. ^ "Early history of Guinness World Records". 2005. p. 2. Archived from the original on 1 July 2007. ^ Cavendish, Richard (August 2005). "Publication of the Guinness Book of Records: 27 August 1955". History Today. 55. ^ Guinness World Records 2005. Guinness; 50th Anniversary edition. 2004. p. 6. ISBN 1892051222. ^ "Guinness Book History 1950 - Present". spyhunter007.com. ^ "Guinness World Records Corporate - Home". guinnessworldrecords.com. Archived from the original on 21 August 2015. ^ "Record Breakers' McWhirter dies". BBC News. 20 April 2004. Retrieved 9 June 2014. ^ "Most hot dogs eaten in 3 minutes". Guinness World Records. Retrieved 12 January 2019. ^ "Largest tumour - removed intact". Guinness World Records. Retrieved 12 January 2019. ^ "Most poisonous fungus". Guinness World Records. Retrieved 12 January 2019. ^ "Longest running TV soap opera". Guinness World Records. Retrieved 12 January 2019. ^ "Mystery billionaire takes out historic $201 million life insurance policy". Guinness World Records. 13 March 2014. Retrieved 12 January 2019. ^ Guinness Book of World Records (UK ed.). 2006. p. 126. ^ "r/IAmA - I am Craig Glenday, Editor-in-Chief at Guinness World Records - the world's best-selling annual book – AMA!". reddit. Retrieved 12 January 2019. ^ "The application process". Guinness World Records. Retrieved 12 January 2019. ^ "Guinness Record Book Collecting". www.book-of-records.info. Retrieved 12 January 2019. ^ "Guinness World Records honors one man's historic milestone – 100 Records Broken! – Guinness World Records Blog post". community.guinnessworldrecords.com. Archived from the original on 12 June 2009. Retrieved 29 December 2009. ^ a b "Records Shatter Across the Globe in Honor of Guinness World Records Day 2006". Archived from the original on 18 July 2012. Retrieved 29 April 2007. ^ Guinness World Records Live: Top 100. Guinness World Records. Retrieved on 6 November 2008. ^ "Whey to go: Whole Foods Market® cracks Parmigiano Reggiano Guinness World Records® Title". Yahoo Finance. 22 April 2013. Archived from the original on 10 May 2013. Retrieved 15 June 2013. ^ "Guinness World Records Corportate". Guinness World Records. Archived from the original on 12 May 2012. Retrieved 10 May 2012. ^ "Guinness World Beer Record". 11 June 2004. Retrieved 10 February 2010. ^ "Video clip". Retrieved 29 April 2007. ^ a b "IS YOUR PROPOSAL A POTENTIAL GUINNESS WORLD RECORDS™ ACHIEVEMENT?". "Guinness World Records". Retrieved 10 May 2012. ^ a b Guinness Book of World Records. 1990. p. 464. ^ "Guinness World Record Book Entry". Guinness World Beer Record. 11 June 2004. Retrieved 10 February 2012. ^ "Guinness World Record Book Entry 2008". Guinness World Beer Record. 11 June 2004. Retrieved 10 February 2012. ^ "Longest Dreadlock Record – Rested – Guinness World Records Blog post – Home of the Longest, Shortest, Fastest, Tallest facts and feats". Community.guinnessworldrecords.com. Archived from the original on 5 October 2011. Retrieved 4 November 2011. ^ "Frequently Asked Questions". Guinness World Records. Retrieved 14 December 2016. ^ "Bob Munden • Six-Gun Magic Custom Gunsmithing - Bob & Becky Munden - Six-Gun Magic Gunwork". bobmunden.com. ^ "Travel & Outdoors - The Good, The Bad, The Ugly: A 1995 Travel Retrospective - Seattle Times Newspaper". nwsource.com. ^ a b Brown, Robert H. "The Guinness World Records Experience: one of Florida's Lost Tourist Attractions". Retrieved 1 February 2009. ^ Ripley Entertainment, Inc. "Guinness World Records Experience locations". Archived from the original on 20 January 2009. Retrieved 1 February 2009. ^ a b Ripley Entertainment, Inc. (20 November 2002). "Guinness World Records Experience locations". Internet Archive Wayback Machine. Archived from the original on 20 November 2002. Retrieved 1 February 2009. ^ "Amazon page for VBBHS". Retrieved 18 February 2009. ^ "Guinness Book of World Records could be next big brand name to hit cinemas". Guardian. 8 June 2012. Retrieved 18 December 2012.